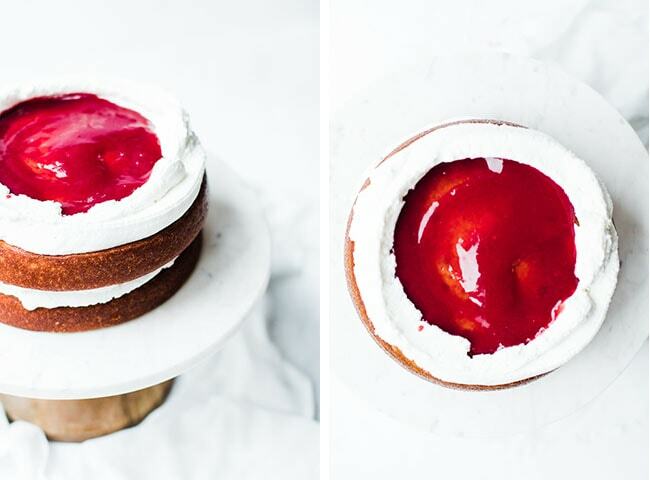 This cake is the only cake recipe you will ever need. It is seriously that good. 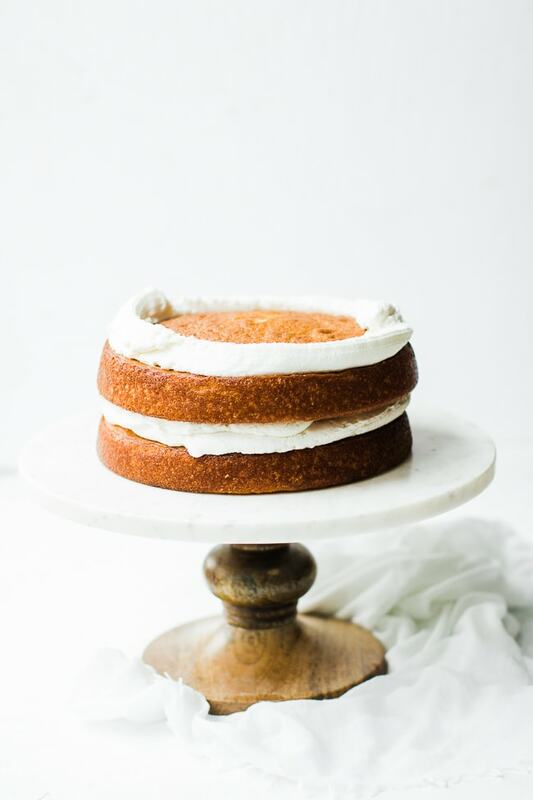 This white cake recipe is soft, fluffy and completely moist. 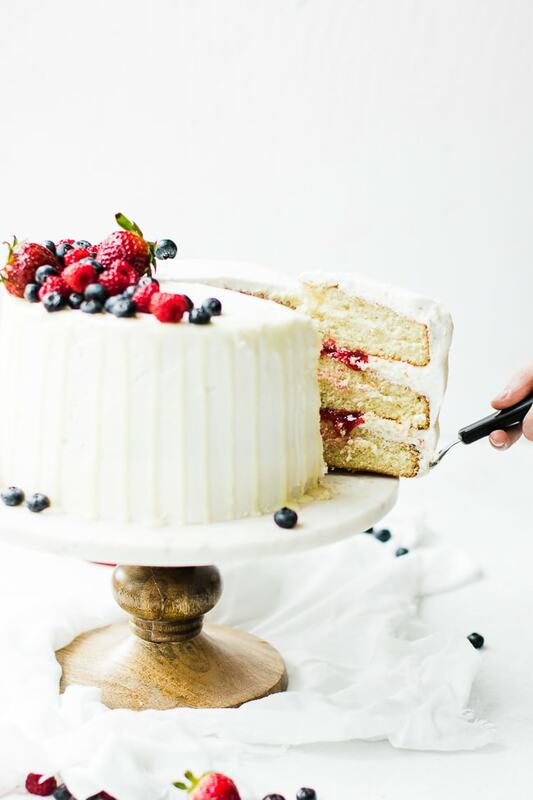 The best part is it is not overly sweet- it pairs just perfectly with the sweetness of the frosting and additional fillings. 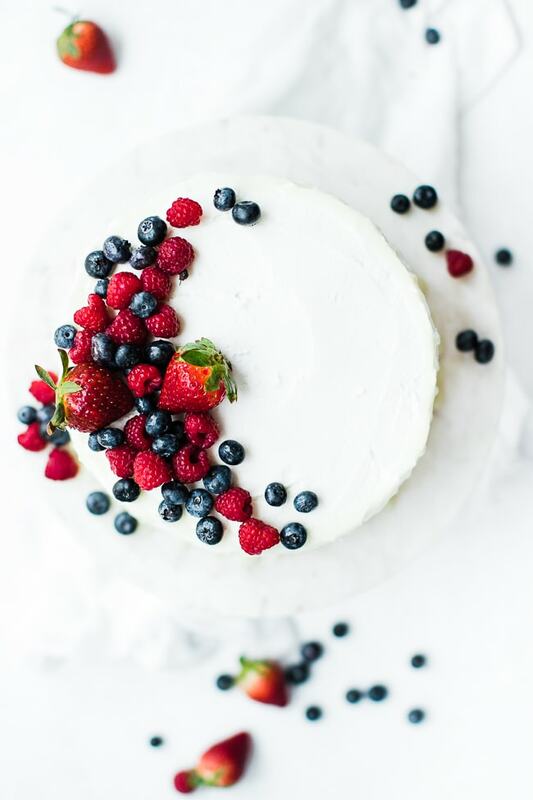 Great rich, full flavor that will compliment any frosting, any filling, and toppings and definitely make every eater happy! 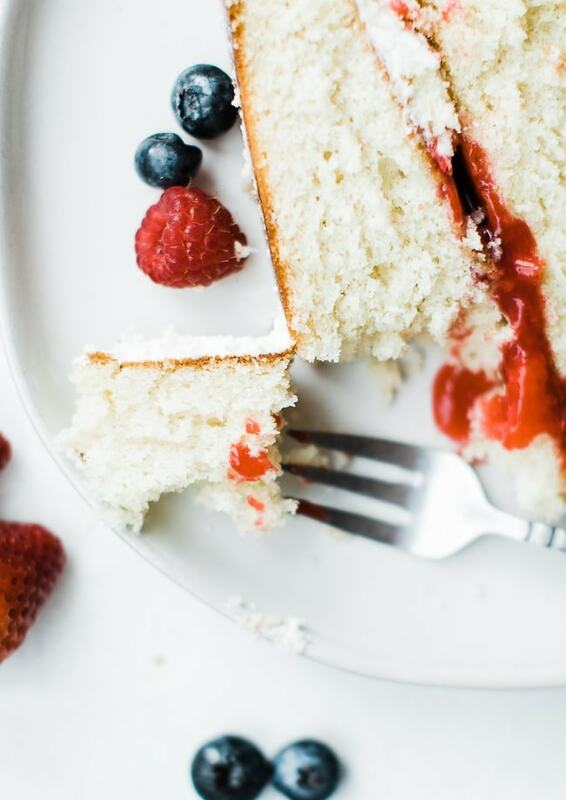 One of my favorite qualities about this cake is that it is so easy and comes out perfectly moist and fluffy. Make your own buttermilk you say? YES! I don’t alway have rich creamy buttermilk on hand when I spur of the moment decide to bake. So I make my own! I really have found some of my favorite baking recipes involve buttermilk. It helps keep the moisture in while giving it a great flavor. 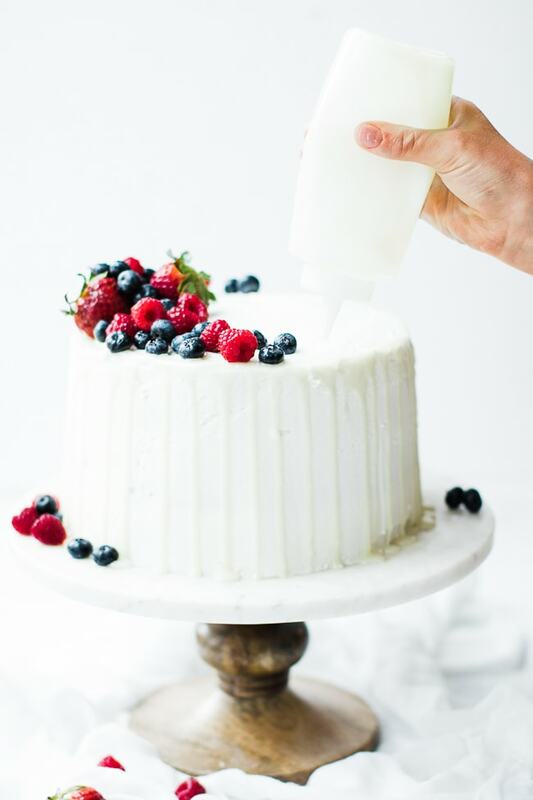 To make your own buttermilk simply add 1 tbs of vinegar or lemon juice to 1 cup of milk (or heavy cream or half and half) If I have half and half on hand I prefer to use that because it best mimics the thickness of buttermilk. Step 2: In a medium bowl mix dry ingredients: 3 C flour,1 1/2 tsp baking powder, 3/4 baking soda and 3/4 salt; sift and set aside. Step 3: In a large mixing bowl beat 3/4 C butter with an electric mixer on high for 30 seconds. Add2 2/3C sugar and 2 tsp vanilla; beat until well combined. Step 4: Add egg whites and beat on medium-high for 3 mins. Now you have your batter base. Step 5: Alternate adding flour mixture and buttermilk mixture about a 1/3 of each at a time. Beat on low after each addition until well combined. Divide batter evenly among 3 eight inch prepared pans. 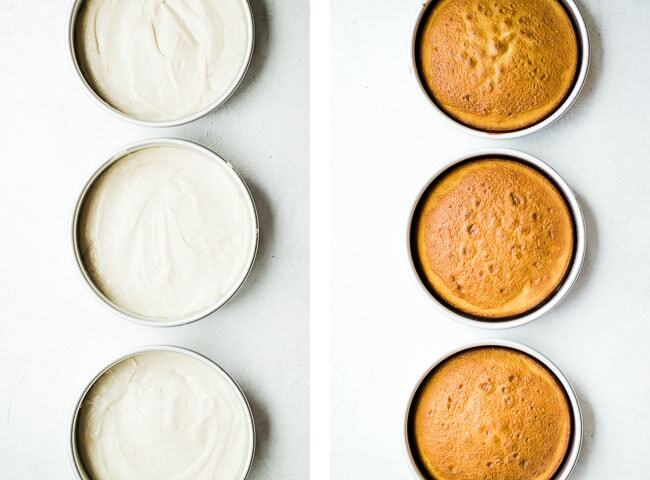 HOW TO MAKE YOUR PANS SO THE CAKE DOES NOT STICK! Trace and line the bottom of the pan with a piece of parchment paper. Spray the sides with a quality non-stick spray like PAM. You can also do the tradition butter/flour method. However, PAM works a lot easier and faster. Bake in preheated oven 30-35 mins, or until toothpick comes out clean. When done immediately stick into freezer to lock in moisture, if unable cool on wire racks for at least 10 mins before removing cakes from pans. Now that your cake is beautifully baked and cooled you are ready to stack this bad boy!! 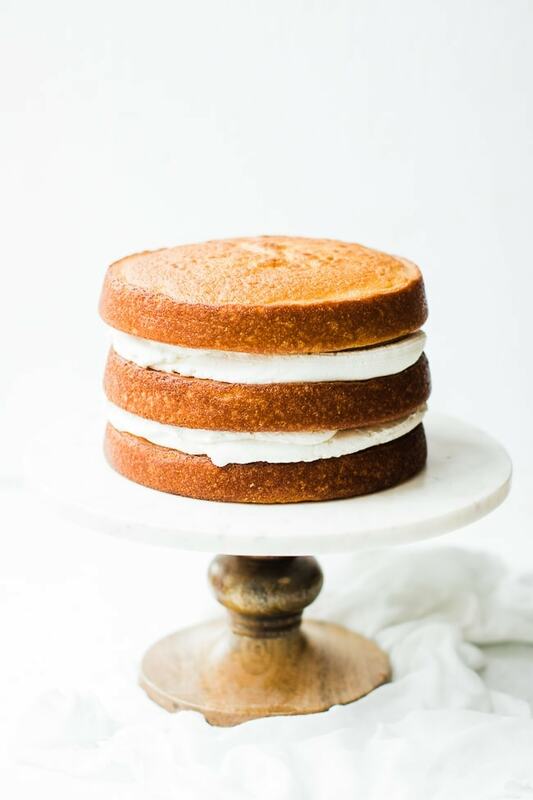 You’ll definitely want to double it for a layered cake.So no matter what recipe you use, make sure its about 8 cups of powder sugar and a cup of butter/shortening etc. I also make sure to have my frosting on the thicker side- so make sure to not add too much milk or have your butter or frosting too warm. On your cake plate dallop about 1-2 tbs of frosting in the middle. Add your first layer centering it. 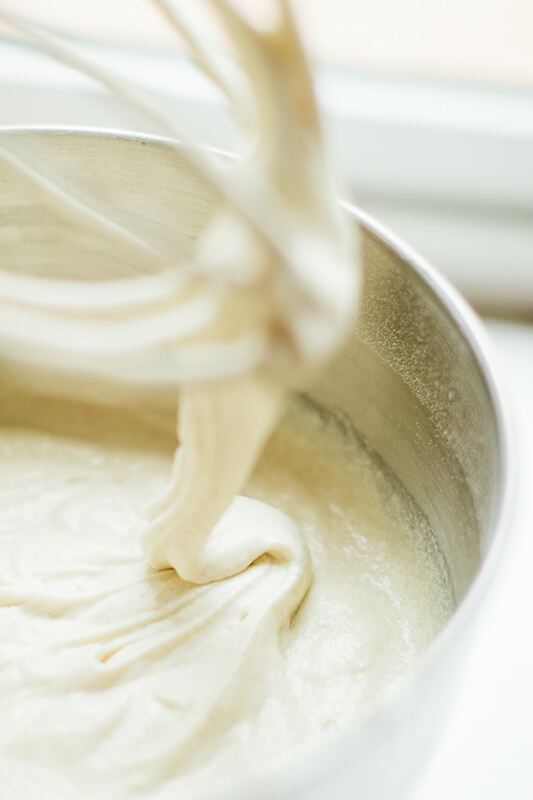 Add a thick, generous circle of frosting on perimeter of cake. 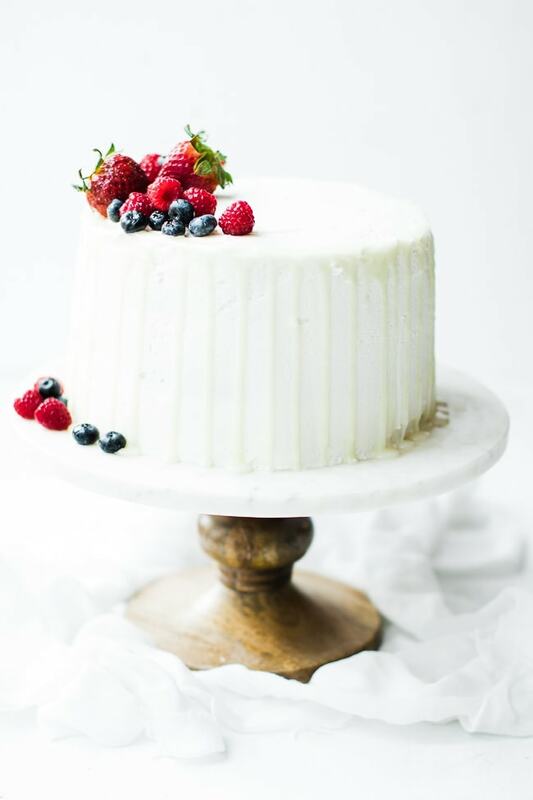 You can fill in centers with more frosting, candies, or my favorite FRESH FRUIT FILLING. Add your third and final layer to the cake, and now you are ready to start frosting the entire outside. I start by generously spreading the frosting all over the cake. Filling in cracks and covering any showing cake. Once the cake has a nice thick semi-even layer of frosting I use a long straight edge like this cake scraper to go around the entire cake and smooth off the top evenly. It makes frosting the cake a breeze!! Add any toppings, drips, sprinkles or keep it super simple and eloquent. Just be sure to serve nice giant size pieces because you won’t be able to stop eating! You can see in the picture below how completely moist, fluffy and perfect this cake is!! Now I’m 100% craving another slice. 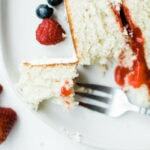 The perfect fluffy, moist white cake recipe. Separate Eggs. 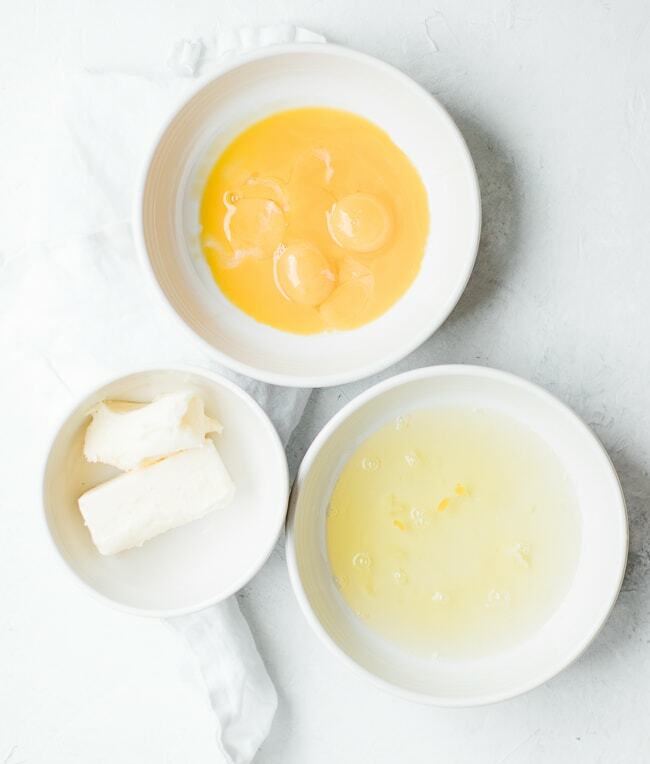 If egg whites are not already room temp, allow egg whites to stand at room temp. for 30 mins. Grease 3 Eight-inch round cake pans with shortening, then coat with flour and set aside. In a medium bowl mix flour, baking powder, baking soda and salt; set aside. Preheat oven to 350 Deg. 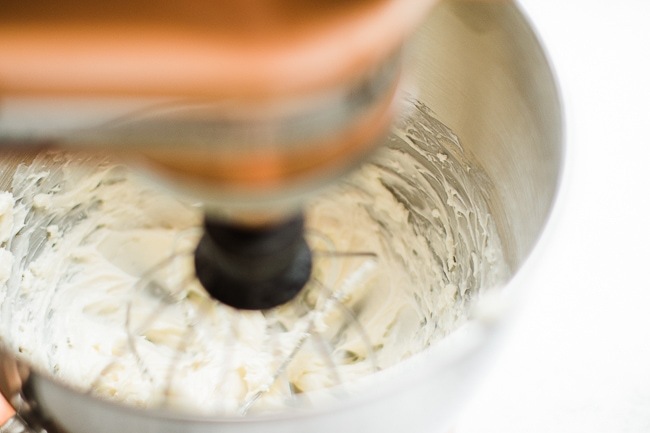 In a large mixing bowl beat butter with an electric mixer on high for 30 seconds. Add sugar and vanilla; beat until well combined. Add egg whites and beat on medium-high for 3 mins. Alternate adding flour mixture and buttermilk mixture about a 1/3 of each at a time. Beat on low after each addition until well combined. Divide batter amongst 3 prepared pans. Bake in preheated oven 30-35 mins, or until toothpick comes out clean. When done immediately stick into freezer to lock in moisture, if unable cool on wire racks for at least 10 mins before removing cakes from pans. Cool thoroughly before frosting. so glad my cakes won’t be dry anymore!